We need strong legs for most physical activities and endurance exercises such as running, climbing and walking. Our muscle mass reduces with age and hence the need for strength training to increase our muscle mass. Strength training reduces your risk of injuries and strengthens your bones. Strengthening your leg muscles protects and stabilizes your knee and hip joints. In addition, increasing your muscle mass will also help you burn calories fast. Here're some simple but helpful exercises for leg strengthening. Lunges strengthen and build muscles on your buttocks and legs including calf muscles, quadriceps and hamstrings. With your hands on your hips, maintain a hip width between your feet as you stand and squeeze your abdominal muscles. Use your right foot to take a long step forward and then lower body until your knee nearly touches the floor. The knee on your right or left leg should go over your toes and the left leg must stay aligned under your hip. Raise your body back to an upright position using your leg muscles. Do the same exercise at least 10 times with your right leg and then change to the left leg. You can use dumbbells of 5-10 pounds to increase your resistance. Increase the number of times you repeat the exercise as you learn how to balance on both legs. Calf muscles refer to the muscles between your knee and ankle on the back of your leg. Calf raises are leg strengthening exercises that strengthen two calf muscles known as soleus and gastrocnemius. Lift your heels simultaneously and use your feet balls and toes to support your body. Hold this position for five seconds before placing your heels back on the floor. Your knees and back should be straight throughout the exercise. Avoid locking your knees and repeat the exercise 20-30 times. Hamstring muscles are the muscles on the back side of your thigh. You can strengthen these muscles through pelvic lifts and static contractions. 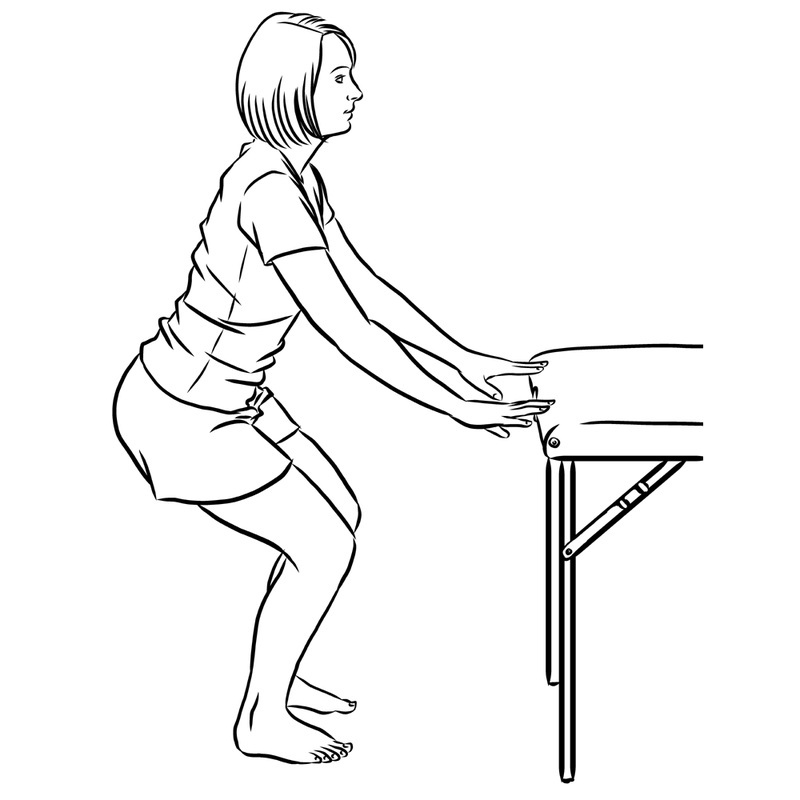 For static contractions, bend one leg to a 45-degree angle as you sit on a bench or chair. Keep your heel on the floor and then press it until the hamstring muscles tighten. Hold the contraction for about five seconds and then relax. Repeat the exercise 8-10 times and then change to the other leg. Increase the number of repetitions or contraction resistance as you progress with the exercise. A hip flexor stretch is one of the leg strengthening exercises that can help to stretch and loosen your hip flexors. Lunge with one foot forward as you bend its knee to 90 degrees. Lower the other knee as you tilt the pelvis forward. Tuck your tailbone until the front of your hip stretches and then hold the position for 20 seconds. Repeat the exercise with the other leg. Lie on the back on the floor. Bend your knees and let your feet lie flat on the ground. Your arms should rest next to your body with the palms facing up. Begin to raise your hips upwards until you achieve a straight line stretching from the shoulders to the knees. Use your core muscles to move your right knee to the chest and then repeat with the left knee. Ankle circles enable you to move the ankle upwards and downwards easily. You can do the exercise as a warm up for the lower part of your leg and feet. Sit on a chair and keep your feet lying flat on the floor. Stretch the right knee upward and then move your foot in 20 circular motions. Change the direction and make another 20 circular motions. Change to the left knee and repeat the circular motions in both directions. Breathing: Exhale when moving upward and inhale when moving downward. The exercise will strengthen your knees. Strong knees improve your balance and ability to stand. The exercise will increase your knee’s range of motion as well. Sit on a chair and place your feet fat on the ground. Stretch your right knee forward and hold it in a straight line for a few seconds. Switch to the left knee and hold it for a few seconds. Repeat the exercises 10 times with both legs. Breathing: Exhale when moving up and inhale when moving down. Partial squats are among the leg strengthening exercises that can help to strengthen your quadriceps and hip flexor. In addition, the exercise improves your ability to rise from a sitting position and walk. It steadies your body and improves your safety and balance. Stand and use a chair to keep your body balanced. Bend your knees to a position where you are comfortable and without pain. Go back to the standing position and do the exercise 10 times. Breathing: Exhale in all upward movements and inhale in downward movements. This exercise will strengthen your quadriceps, hip flexor, and abdominal muscles. It will also help you move your leg forward easily while walking. Lie with your back on the floor and then bend one knee. The other knee should remain straight and your toes facing upward. Raise the straight leg until it is on the same level with the bent knee. Move the leg back to its straight position. Repeat the exercise 10 times on each leg. Breathing: Exhale during upward movements and inhale during downward movements. A heel stand is one of the leg strengthening exercises that target the front part of your lower leg. It strengthens this part and enables you to raise your toes better to avoid tripping. Stand while holding on to chair for balance. Lift your toes as you use your heels for support and then go back to the original position. Do the exercise 10 times. Breathing: Exhale when lifting your toes and inhale when moving them down. This exercise keeps your leg and hip strong. You can use this exercise every day to maintain your confidence and independence. Stand in front of chair with your knees next to the seat. Lean forward with your knees bent and then lower your body as if you want to sit on the chair. Pause just before you touch the chair and then move back to an upright position. Repeat the exercise 10 times. Breathing: Exhale when raising yourself upward and inhale when lowering yourself. The exercise improves your hamstring muscles strength and your standing balance. Stand while using a chair for balance. Bend the right knee to the highest position you can and then move it back to the original position. Repeat the exercise 10 times and then change to the left knee. Should You Work out When You're Sore? What Do Antidepressants Feel Like? What Are the Benefits of Running in Long Distance?